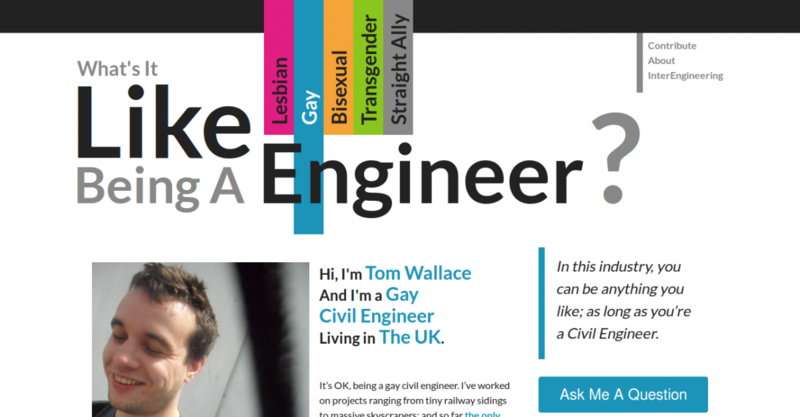 The ‘What’s it like’ campaign is the first of, hopefully, many run by InterEngineering as part of our ongoing remit to Connect, Inform and Empower lesbian, gay, bisexual and transgender engineers, and their straight allies. At the very least, 2-3 people wonder what it’s like to be an LGBT engineer every day. At the very least, 2-3 people wonder what it’s like to be an LGBT engineer every day. This campaign aims to definitively answer the question by collecting together experience profiles from as many different engineers as possible. We hope that by providing an answer, questioners considering a career in engineering- but worried by their perception of the profession- can make a more informed judgement about whether it’s the career for them. We also hope that the website will he a valuable resource for practising engineers looking to work abroad to get first hand accounts of what it is really like; especially in countries where our rights are not legally protected. The campaign will officially start later this month, but we’re looking for profiles from our members now- so please visit the site and share your experience!